Thirty-eight volumes bound as thirty (29.5 cm), volumes 52-73 bound individually, thereafter two volumes are bound together, in harmonious quarter-vellum bindings (some original wrappers discarded). With: Indice venticinquennale 1924-1948 [volumes 26-50] (Florence 1956), (29.5 cm), 217 (7) pp. 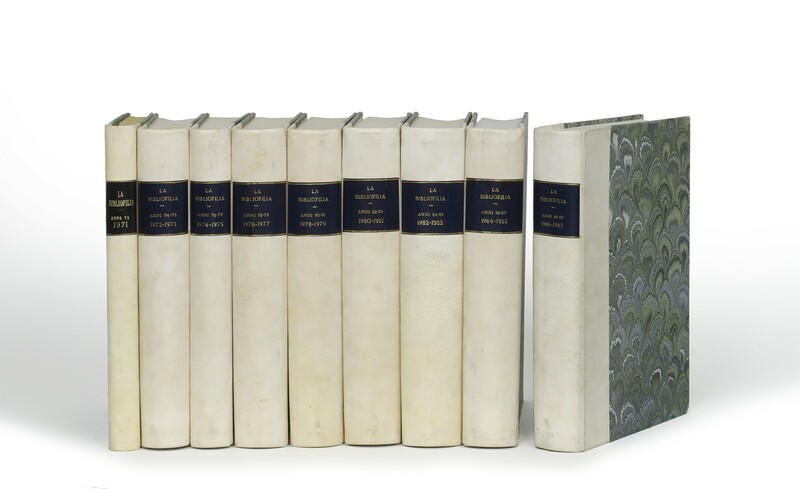 Publisher’s printed wrappers; Indice trentennale 1949-1978 [volumes 51-80] (Florence 1984), (29.5 cm), 161 (1) pp. Publisher’s printed wrappers. - A long run (1950-1987) of the leading Italian bibliographical journal, La Bibliofilía. 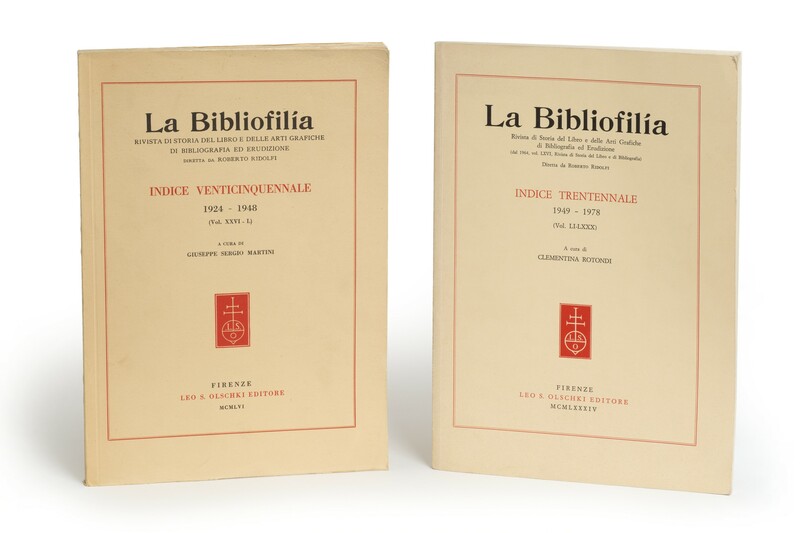 From 1944-1978 editorship of La Bibliofilía was in the hands of Marchese Roberto Ridolfi (1899-1991), “the one great twentieth-century Italian analytical bibliographer” (Conor Fahy), and during his tenure the journal published many outstanding articles. ISSN 0006-0941. Offered with The useful “Indice venticinquennale” (1924-1948) was compiled by Giuseppe Sergio Martini; the “Indice trentennale” (1949-1978) by Clementina Rotondi. ¶ “Exlibris Aleramo Spada” (in volumes 52-68 only). 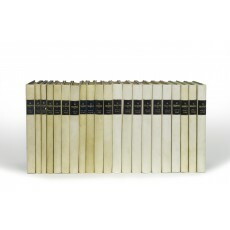 Shelf-wear along edges of the earliest volumes. 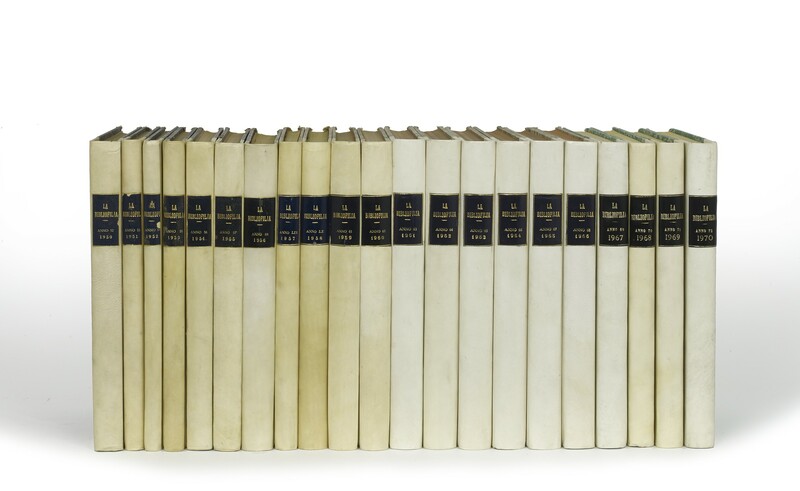 Loosely inserted in appropriate volumes: “Indici cumulativi dei volumi LI-LII (1949-1950)”, 16 pp. ; Anni LIII-LV (1951-1953),  pp; Anni LVIII-LIX (1956-1957),  pp. ; Anni LX-LXI (1958-1959),  pp. ; other volume indices are bound in place. The index “Anni LVI-LVII” (1954-1955) is lacking.